INDIO, Calif.– Popular undefeated hometown favorite Randy Caballero (16-0, 8 KOs), of Coachella, Calif., scored a knockdown in the second round en route to a 10-round decision over Manny Roman (15-2-3, 6 KOs), of Paramount, Calif. to retain his NABO Bantamweight Championship on Friday’s main event on ShoBox: The New Generation live on SHOWTIME. 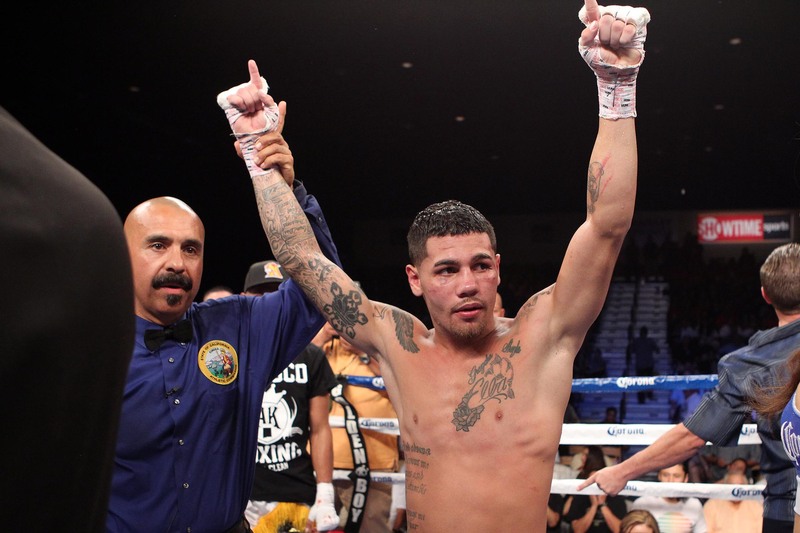 In the co-feature at Fantasy Springs Resort Casino in Indio, Calif. Michael “The Artist” Perez (17-1-1, 10 KOs), of Newark, N.J., survived a knockdown in the bout’s closing seconds to take a hard-fought 10-round split decision over tough southpaw Fidel Maldonado (13-2, 11 KOs), of Albuquerque, N.M.
Caballero, the No. 6-rated 118-pound contender by the World Boxing Organization (WBO), won by the scores of 97-92 and 96-93 twice. Perez was triumphant by the scores of 97-92, 95-94 and 94-95. 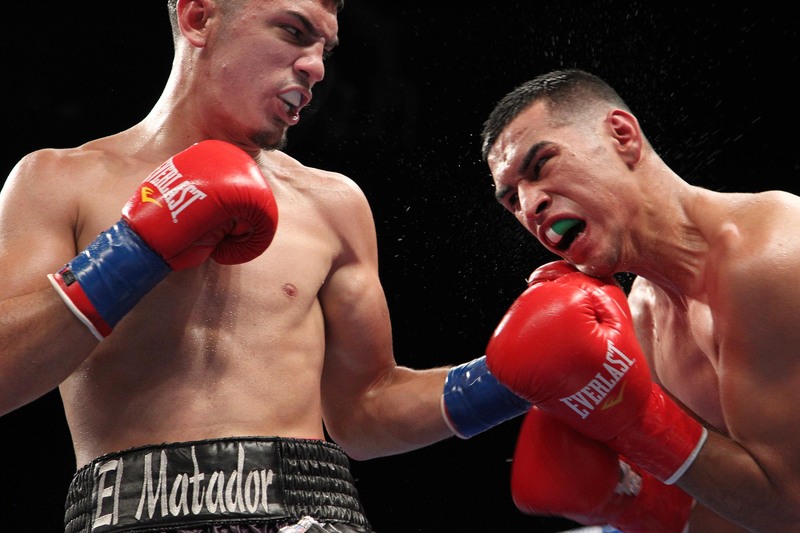 Caballero vs. Roman and Perez vs. Maldonado were presented by Golden Boy Promotions and sponsored by Corona. “This was a good ShoBox card featuring very young fighters who took another step to becoming hardened 10-round fighters,’’ ShoBox expert analyst Steve Farhood said afterward. “Caballero fought his fight, dictated the pace and outboxed Roman from a distance. After scoring that early knockdown, he was never in danger of losing. “The first fight brought back memories of Montreal and the first fight between Lucian Bute and Librado Andrade because the guy trailing scored a knockdown in the last 10 seconds of the last round. And as was the case with Bute and Andrade, the knockdown punch was the last punch of the fight. 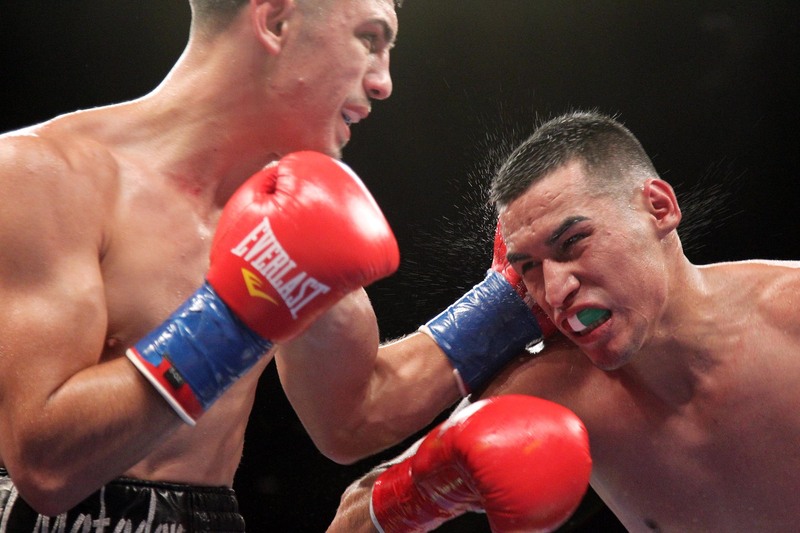 Caballero, 21, struggled in his ShoBox debut on March 16, but he had things his way Friday. The victory capped a huge night for Caballero and his brothers, Ryan, who won his pro debut in a non-televised fight, and Rommel, who won an amateur bout. After falling behind, Roman made it interesting in the later rounds by effectively working the body with both hands. It wasn’t enough, however, to overcome the early deficit. Perez, 22, won most of the early rounds against Maldonado, 21, who came on strongly in the hotly contested bout’s second half. 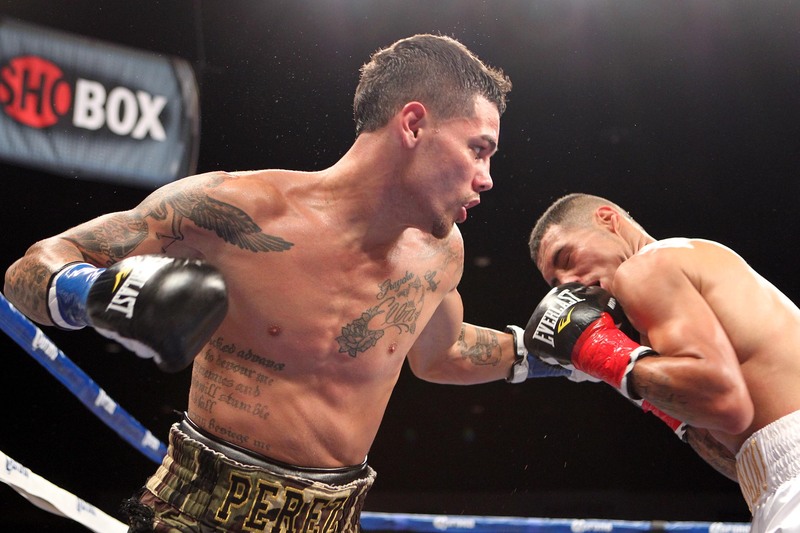 Neither boxer was impressed by the judges’ scoring; Perez felt he had won clearly, Maldonado believed he was jobbed. Those in attendance received a special treat Friday. Before the televised portion of the card, Future Hall of Famer, the legendary Bernard Hopkins, hosted a meet and greet with the fans where he signed autographs and posed for pictures with them. Friday’s fights will be available ON DEMAND beginning today/Saturday, Aug. 25. 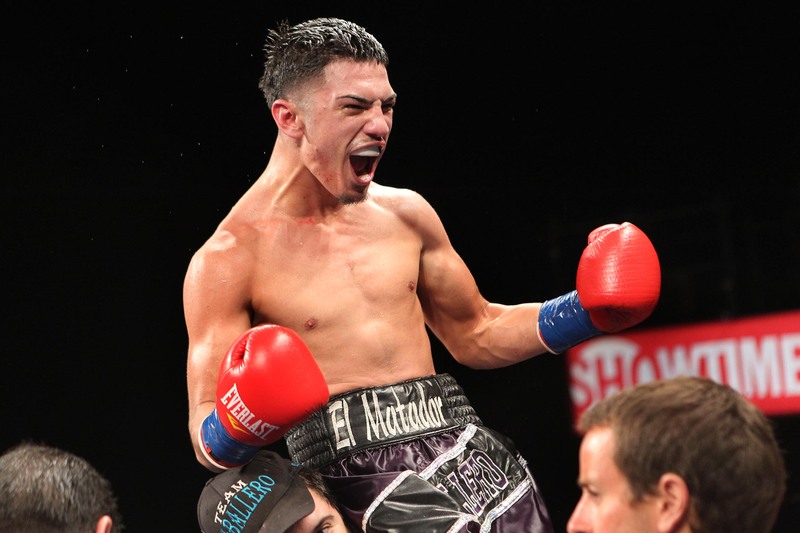 Barry Tompkins called the ShoBox action from ringside alongside Farhood and special guest analyst, former Unified Lightweight World Champion Juan “The Baby Bull” Diaz. “It was an awesome experience for me,’’ Diaz said. “Barry and Steve are such professionals. They made it so easy on me. Gordon Hall is the executive producer of ShoBox with Richard Gaughan producing and Rick Phillips directing. Upcoming Schedule: In the main event on SHOWTIME CHAMPIONSHIP BOXING (9 p.m. ET/PT) on Saturday, Sept. 8, Randall Bailey (43-7, 37 KOs) will defend his IBF welterweight title against former champion Devon Alexander (23-1, 13 KOs) at The Joint at Hard Rock Hotel & Casino in Las Vegas, Nev. In the co-feature, Ajose Olusegun (30-0, 14 KOs) and Lucas Matthysse (31-2, 29 KOs) will clash for the Interim WBC Welterweight World Championship. The following Saturday, Sept. 15, Mexico’s superstar Canelo Alvarez headlines a quadrupleheader live on SHOWTIME (9 p.m. ET/6 p.m. PT) from MGM Grand Arena in Las Vegas. Alvarez (40-0-1, 29 KOs) risks his WBC Super Welterweight Championship against upset-minded breakout star Josesito Lopez (30-4, 18 KOs) in the main event. 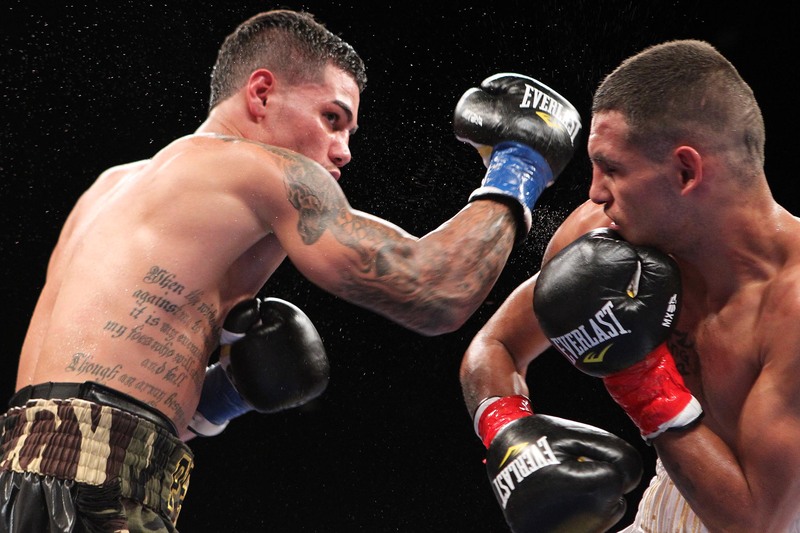 Other fights on “Knockout Kings” feature WBC Featherweight Champion Jhonny Gonzalez (52-7, 45 KOs) as he defends his title against former champ Daniel Ponce De Leon (43-4, 35 KOs) and Marcos Maidana (31-3, 28 KOs) meets Jesus Soto- Karass (26-7-3, 17 KOs) in a 10-round welterweight battle. ShoBox: The New Generation returns on Friday, Sept. 21 (11 p.m. ET/PT), with a doubleheader featuring four fighters with a combined record of 61-1 with 30 knockouts. 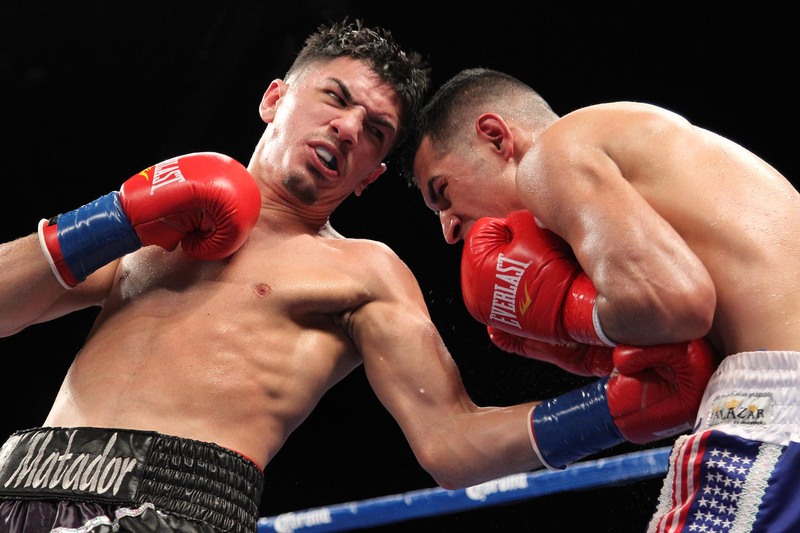 In the main event at Chumash Casino Resort in Santa Ynez, Calif., Jhonatan Romero (21-0, 12 KOs) will be opposed by Efrain Esquivas (16-1, 9 KOs) in a 10-round super bantamweight match. Unbeaten super bantamweights Roman Morales (11-0, 6 KOs) and. Jonathan Arrellano (13-0, 3 KOs) will collide in the co-feature. On Saturday, Oct. 20, there will be two world title fights on SHOWTIME (9 p.m. ET/PT) from the opening night of boxing at the brand new Barclays Center in Brooklyn, N.Y. In the main event on SHOWTIME CHAMPIONSHIP BOXING, defending champion Danny Garcia (24-0, 15 KOs) faces former four division world champion Erik Morales (52-8, 36 KOs) for the WBA Super, WBC and Ring Magazine 140-pound titles and WBA Welterweight Champion Paulie Malignaggi (31-4, 7 KOs) defends against tough Mexican star Pablo Cesar Cano (25-1-1, 19 KOs). Note: Live undercard fights will be televised on SHOWTIME EXTREME before each SHOWTIME CHAMPIONSHIP telecast on SHOWTIME. For more information, visit www.goldenboypromotions.com, www.fantasyspringsresort.com, follow us on Twitter at www.twitter.com/GoldenBoyBoxing, www.twitter.com/fantasysprings or visit us on Facebook at www.facebook.com/GoldenBoyBoxing or www.facebook.com/fantasyspringsresort. For information on SHOWTIME, please visit http://Sports.SHO.com, www.twitter.com/SHOsports or www.facebook.com/ShoBoxing.